included: Realistic physics, intuitive interface, touch sensitive cue stick control, and interactive Career Mode, with six different rooms and opponents. - Career mode played through six rooms and 120 opponents. Beat the boss to advance. - Supported devices: all devices with Windows Mobile 5, Windows Mobile 6 and Windows Mobile 6.1. 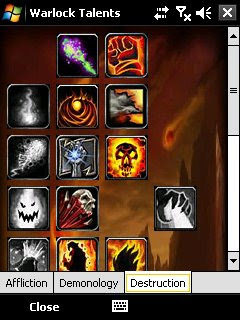 - Skinnable user interface (Lots of skins are available here). - Customizable today plugin which shows you all your alarms and lets you activate or deactivate them with one click. - Define unlimited alarms with many options. - Weekdays: select on which days of the week an alarm should go off. - Alarm patterns: you can define more customized alarms (e.g. play the alarm every 4th week on friday at 7:00 PM). 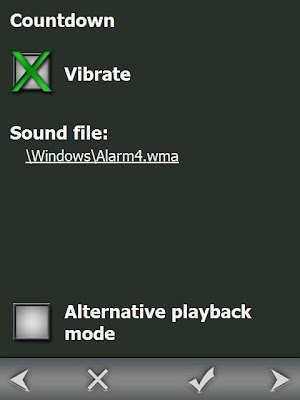 - Define playlists with unlimited mp3/wma/wav files for each alarm. - Force a specific volume if the device is on vibration mode or muted. - Play alarm for a specific time. - Repeat an alarm for x times. - Auto-snooze the alarm after a specifc time. 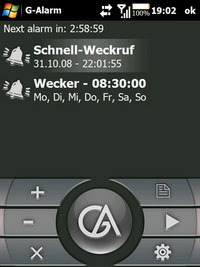 FEWidgets is a widgets for Windows Mobile. This application is only for WM 5/6 Pro. (i.e Pocket PC with Phone). · Haptic feedback. When clicking on widget buttons you'll feel a small vibration. · Multiple Layouts/Pages support (up to 4). · Support for Landscape/Portrait modes. Spb Clone is an application that allows you to clone and restore applications, files and registry settings onto several Pocket PC devices. incomplete tasks grouped by date (Actual, Due today, Overdue and Future tasks). The list can be easily switched between the compact and detailed form. tasks in form you like, in text and caption size you like. Tasks are filtered by categories. Windows Mobile 5.0 compatible. Supports new PIM notification system. Windows Mobile 2003 SE compatible. Fully supports hi-resolution screens with landscape rotation. Square screen devices are also supported. Small footprint. Installation size takes about 60 kb for the main library, additional language packs have approximately 7 kb each, but they are not required for run. supported and included in the menu. language packs. These packs are not required by the plug-in to run, so you can delete them. Additional language packs are coming. TodayAgenda displays appointments and tasks on your today screen up to 30 days in advance. It replaces the default Outlook plugin with a lot of more features. - View appointments (including location) up to 30 days in advance. - View tasks (include status) up to 30 days in advance. - View birthdays/anniversaries from your contacts up to 30 days in advance. - View current day and time. - Open tasks and appointments from your today screen. - "Complete" tasks via context menu on your today screen. - Create new appointments and tasks via context menu on your today screen. - Delete appointments and tasks. - Open calendar, task list and time/alarm settings (tap and tap'n'hold on the TodayAgenda icon or clock). - Anniversary function: for all day, free, yearly appointments without end date the years since the beginning are displayed. - Collapse/expand days and task list (double click onto day/task header). - Filter items by category. 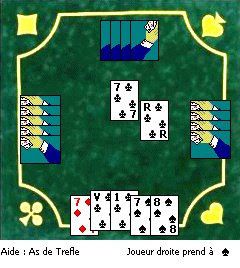 The mobile version of Belote, one of the most popular card games in France. You have a powerful smartphone with you all the time (anyways!) and we have an excellent application; why do you need a paper and pen or remember yourself the items you want to shop? Here comes our "Shopping List" to keep track of your shopping list. simple! No matter what phone they use, just a text message from any source or even from internet would do. This application takes care the rest! mobile.yahoo.com). Download the trial and see for yourself this innovative feature and learn more about the format of the text messages the application can handle. 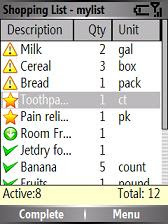 · Add or edit your shopping items with ease. · Set priority for each item (identify your priority easily with cool looking icons). · Sort your items either by description or priority. · Filter them by ''active'' or ''completed''. · Enter some note for each item if you like. · Create and maintain as many lists as you like and export or import items between them. 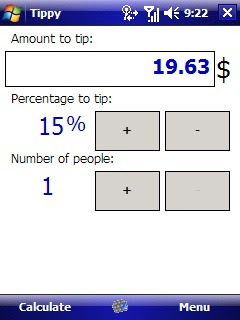 Tippy is a small tip calculator and bill splitter for Windows Mobile devices. The screenshot speaks for itself: it's small, it's simple and it gets the job done. interface exactly as you like it, with style and enhanced functionality. Love twitter and love tweeting from your mobile device? But don't want to get dinged for updates and double dinged for friend updates continually arriving via SMS? 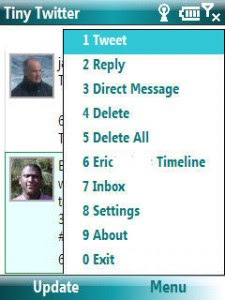 Tiny Twitter is just what you are looking for and it works on ANY Java enabled device and ANY Windows Mobile Pocket PC or Smartphone. A very basic application which records the accelerations experienced by the HTC Touch Diamond giving a rough idea of the accuracy of the accelerometer. Since my next device will be an XDA Diamond (I guess) where Today-Plugins can't be used together with TouchFlo 3D -> I've released a very early alpha version of SecondToday. 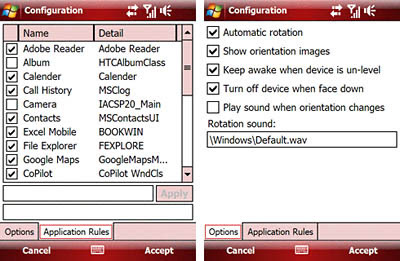 SecondToday is an application that behaves like the default Today screen. This way you can use e.g. TouchFlo 3D and all your Today plugins (wrapped by SecondToday) or use it to test Today plugins. Seesmic is a video micro blogging web application to make video uploading easier for those using webcams. Its also known as “Twitter of video”, however conversations will not take place in real time. now they have Windows Mobile client. 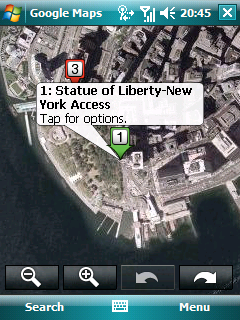 The application currently is designed for touch screens with a stylus. Mobile version of the well known game Halma, the most peaceful board game. The object of the game is to move your pieces to the opponent's corner. · Powerful Artificial Intelligence game Engine. · 14 Predefined starting positions and random positions generated on the fly. · Unlimited undo and hints. KeySwop is a simple tool for you to remap the softkeys on the today screen. 1. Select the target links using the "Browse" buttons and edit the labels if needed. 2. 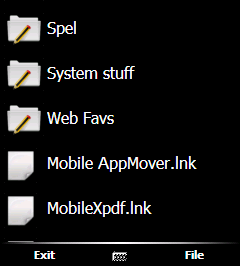 You can also add new shortcuts to your Start Menu from the dropdown list using the "Add" button. 3. Click on "Apply" to apply the changes for the relevant softkey. 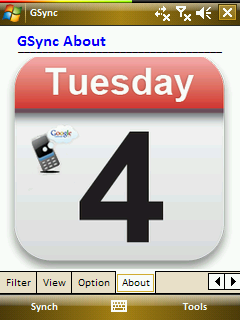 GSync is a tool to synchronize your mobile device with Google services. Currently imports of Google calendars, and contacts GMail. GSlide is a simple yet versatile file explorer with a thumb friendly kinetic slider interface. Right now it explores only files and folders, but pretty soon you will be able to iterate xml. Or any structured data actually. For now it is only a viewer, so it wont mess around with files and should be harmless. Of course, as usual, no guarantees of any sort are given. To install just drop the folder into your Programs folder. It works wherever you place it, but I have set up some example shortcuts with command line arguments which assume that you put it at the default location. Simple and easy-to-use note taking application. You can create and manage notes directly on your smartphone. It comes with a QuickNotes Companion application that runs on your Windows Desktop. - Create, edit or delete notes on the Smartphone. - Manage your notes from your Windows Desktop using QuickNotes Companion. - Categorize your notes by creating different categories. - Bring your notes from your previous devices with ease by importing CSV files. - Export your notes as CSV files, easy to port your notes to any application or device. 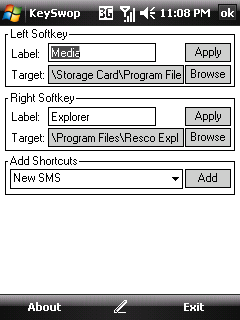 - Send or Receive notes from other Windows Mobile devices using Text Messages. Cruising around looking for a nearby coffee shop? Driving to that new restaurant but can't remember which street to turn right on? Now you can get business locations, maps and directions while you're on the go. And it's all free. Tilt key: Which key the software simulates when you tilt your device to the left. The tilt side never changes, even if you rotate your device. It is based on when you hold your device in portrait mode flat down. Tilt sensitivity: this is a number (between 0 and 100) setting the tilting minimal for the action to be sent. The more you're close to 0, the more sensitive it will be. If you set it to 100, it will never trigger. Interval: the interval at which keys are pressed. This means that if you set it too low, while tilting your device, a lot of keys will be sent. It is calculated in milliseconds. So if you set it to 1000, when you tilt your device, it will simulate 1 press per second, per key. Setting it low enough is useful for games, for example. G-Watch is a stopwatch which supports GPS devices. It keeps track of your distance, speed and altitude. * Option: lock the screen and buttons when a timer starts. Option to turn of the backlight at the same time. * Assign split time to a hardware button. 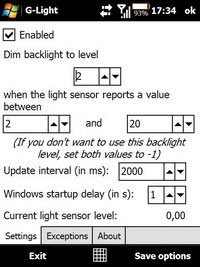 If backlight is off, show backlight for a configurable amount of seconds (whiteout releasing the lock) before the backlight automatically turns off again. * Assign stop/resume to a hardware button. Stopping the timer should automatically turn on the backlight and release the lock. If the timer resumes, apply the lock again and turn off the backlight. FetchIt! is the fast and easy way to get news, sports, entertainment, blogs and podcasts on your Pocket PC or Smartphone. It's the slickest mobile RSS, ATOM and Podcast player you've ever seen! Try to make as many 21's, blackjacks, trik5's... as fast as you can all while progressing through different levels around the world in this addictive game that will both exercise and sharpen up you mind. 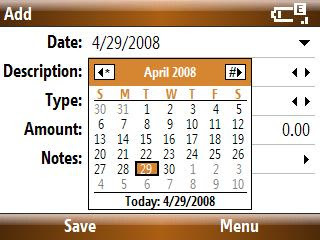 EdgeWay Pocket Plus is a collection of useful utilities for your Pocket PC: reboot, screen off, memory stats, countdown timers, unit converter, stopwatch, quick access to useful Windows Mobile features, calculator, notes, calendar and file explorer, YouTube, Google mobile, Ebay mobile, weather and downloads right to your device. 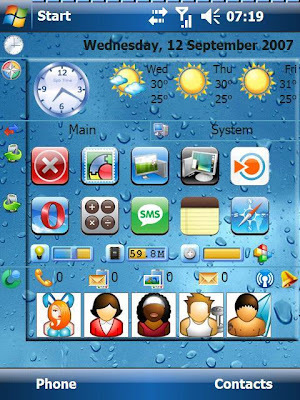 Diamond TF3D Config is a very useful tool for all the HTC Touch Diamond owners, it gives you the ability to change the tab positions, date format, larger font in tab list, Remove lock and many other tweaks. Clear Temp is a utility which cleans the Temp folder each time you reset your device. Useful if you don't want to see this directory grow and reduce available RAM. 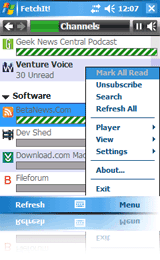 - Improved checking of dead shortcuts. - Improved checking of "Bad Uninstall Registry". - Columns are now auto-resized to occupy entire screen width available. - New MRU Cleaner feature. Now you can play Transport Tycoon Deluxe on the go! OpenTTD lets you experience the greatest of tycoon game on the palm of your hand, available for both Pocket PC and Palm OS 5. You'll be put in the middle of a thriving landscape of cities. In order to become the transportation tycoon, you'll need to build trains, planes, ships, and automobiles and send them off to make you rich. Transport coal to the power station for top dollar, or logs to the sawmill to produce goods. Take those goods to a nearby city and cash in, but don't forget to pick up passengers waiting at the bus station! From advertising to construction, you'll do it all with up to 7 computer opponents all wanting to be the next tycoon! OpenTTD is a FREE download. However, we are encouraging everyone who enjoys playing the game to donate to the project so we can continue improving and enhancing the software. Please click the BUY button if you wish to donate any amount. This is BrinsOnet Screen Rotator which detects the orientation of the device and uses its built-in configuration dialogues to create rotation behavior rules for specific applications, with an extended option to blacklist and whitelist un/wanted programs. A very neat feature is that it will turn the screen off if the device is placed face down but it also has a great option to prevent the screen from going off automatically if the device is not perfectly laid down flat. Shake your HTC Touch Diamond for the animal to express itself. Small detail: it looks like it follows you with the eyes ... or is it an optical illusion? ou can replace or add sounds (the application detects meuhx.wav files in its installation folder). Alcograph calculates the evolution of alcohol in the blood following the consumption of alcohol. Need an application on your Windows Mobile device so you can view yours and your friends' character profiles for World of Warcraft? Then this is the program for you! You can even tap on the pictures of your inventory to see a detailed description of the item! 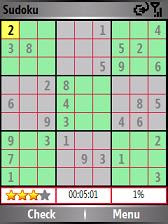 Sudoku game that can generate thousands of unique puzzles, can show hints, pencils and save status. Can send/receive puzzles via SMS. Create your own puzzle. The aim of the puzzle is to enter a number from 1 through 9 in each cell of a 9x9 grid made up of 3x3 subgrids. When a new puzzle is created, the grid is given with partially filled cells, the challenge is to fill the empty cells with one condition: each row, column or region must contain only one instance of each number. · Differentiates User entries, Hints and Solution in various colors. 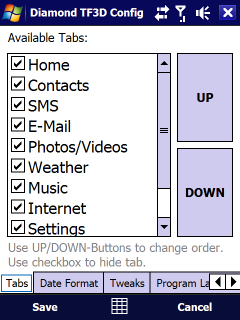 · Popup menu to access frequently used commands such as undo, redo etc. · Saves puzzles to retrieve at later time. Winner of Best Dictionary in the 2005,2006 and 2007 PPC Awards! The first speaking english dictionary with 185,000 entries, 4100 idioms, Thesaurus, Grammar Handbook and Study Assistant. 320x320 ready! 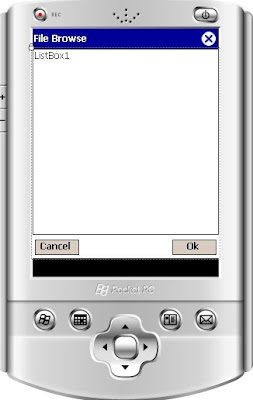 All Pocket PC Devices, Pocket PC Phone Edition, Pocket PC 2003, 2003 SE,WM 5.0 ,Windows Mobile 6.0 and 19 MB of free space. Visual task switcher in the style of Dynamo 3, but written in native Win32 C++. You should map the program to an Application button and to autostart. Once started, the program shows a blank screen. After this moment it monitors the running tasks and takes screenshots. Just tap on the screen to minimize. · technology switch to DirectDraw. Better performance in scrolling and zooming. 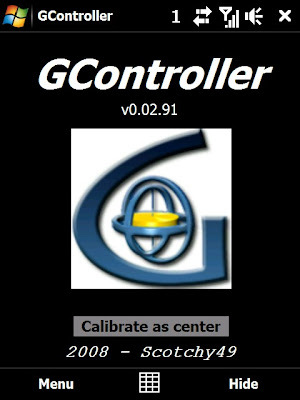 · Version 0.961 still available for devices where the 0.97 version won't work. 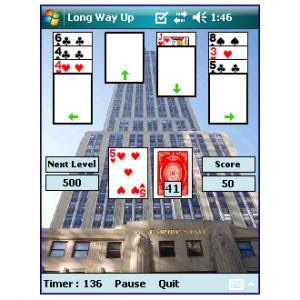 Calling card is a must have feature which is missing in Windows Mobile smartphones. 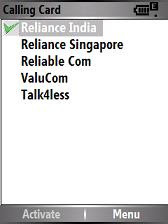 Some people like to make international calls using calling cards/phone cards from their mobile phones due to the expensive direct international calling rates. Simply create a calling card entry in "Contacts" with first name as "CallingCard" and your calling card access # and pin as work phone (like 1-800-123-4567pp1234pp). Hereafter, for each contact you select, you will see new menu entries for the right soft 'menu' button. This application is "free" and fully functional. Download the trial version and you can use it as long as you want (there is no trial period). If you like it, please consider buying it to support the future development. 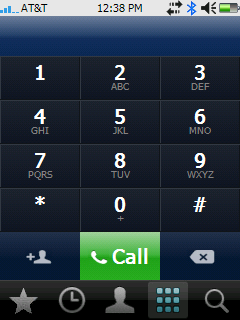 · You can make a calling card call directly from the Contacts application. · No need to learn another new interface for Contacts. 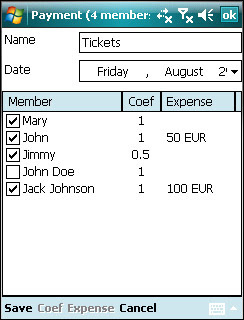 · It uses the existing built-in Contacts application and adds soft-key menus. Best CallMan extends the possibilities of your mobile device by adding some extra actions after the call. It allows to call back, to add or refresh a contact, to create a calendar event, to send and SMS or create a call reminder. S2U2 is the new version of Slide 2 Unlock. S2U2 is a lock/unlock application which has the iPhone style slide unlocking. It can be used as a screensaver while you don't use your device. 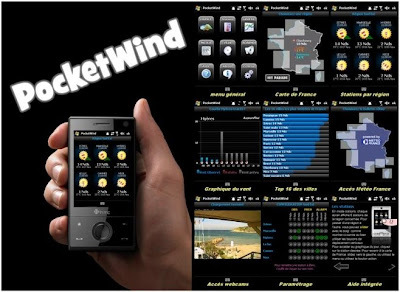 Pocket Wind displays weather information for 3 towns near the Mediterranean (Marseile, Hyeres et Nice) each day. The displayed data are: wind speed and direction, atmospheric pressure and temperature. There is also a graph which shows the daily wind speed (for each town). There is also a weather bulletin for the region. 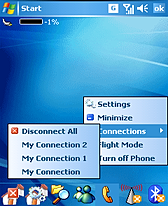 · You need an Internet connection to use this program, but it also works with a Pocket PC connected via ActiveSync. · If you are running a Pocket PC earlier than Windows Mobile 2003 you'll need the Microsoft .NET Compact Framework. At last, here is a simple and easy-to-use expense tracking application for your WM smartphone. Track your personal or business expenses effortlessly. · Create, edit or expenses on the phone itself. 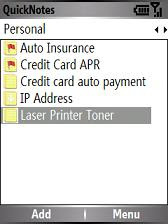 · Create multiple expense files as you wish. · Store your data wherever you like either in the device or in the storage card. · Export expenses as CSV files. Easy to port your expenses to any application or device. · Import expenses from CSV files and keep it up-to-date on travel. RAR files can usually compress content 8 to 30 percent better than ZIP files. 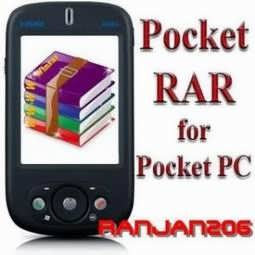 Pocket RAR is a version of RAR archiver for Pocket PC 2002 platform. 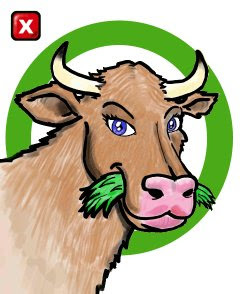 You may find RAR versions for Windows (WinRAR), Linux and other operating systems on http://www.rarlab.com. Pocket RAR is able to compress, decompress and delete files in RAR and ZIP archives. It does not provide many advanced functions available in WinRAR, for example, archive repair or authenticity verification. Such functions were removed to make the executable size smaller and reduce amount of precious Pocket PC memory occupied by the archiver. Advanced archive processing can be done on the desktop computer having more memory and faster processor. Simple text editor which runs from the storage card and saves all its text files there so you never lose them.